♥ Right Seat? This is an easy one. Check the label on your car seat to make sure it’s appropriate for your child’s age, weight and height. Like milk, your car seat has an expiration date. Just double check the label on your car seat to make sure it is still safe. ♥ Right Place? Kids are VIPs, just ask them. We know all VIPs ride in the back seat, so keep all children in the back seat until they are 13. ♥ Right Direction? You want to keep your child in a rear-facing car seat for as long as possible, usually until around age 2. When he or she outgrows the seat, move your child to a forward-facing car seat. Make sure to attach the top tether after you tighten and lock the seat belt or lower anchors. Continue to use a booster seat until your child properly fits in the seat belt, usually when they are between the ages of 8 and 12. ♥ Inch Test. Once your car seat is installed, give it a good shake at the base. Can you move it more than an inch side to side or front to back? A properly installed seat will not move more than an inch. ♥ Pinch Test. Make sure the harness is tightly buckled and coming from the correct slots (check car seat manual). Now, with the chest clip placed at armpit level, pinch the strap at your child’s shoulder. If you are unable to pinch any excess webbing, you’re good to go. The at-home checklist is meant to be a first step. Parents are encouraged to read the vehicle and car seat instruction manuals to help with the checklist. 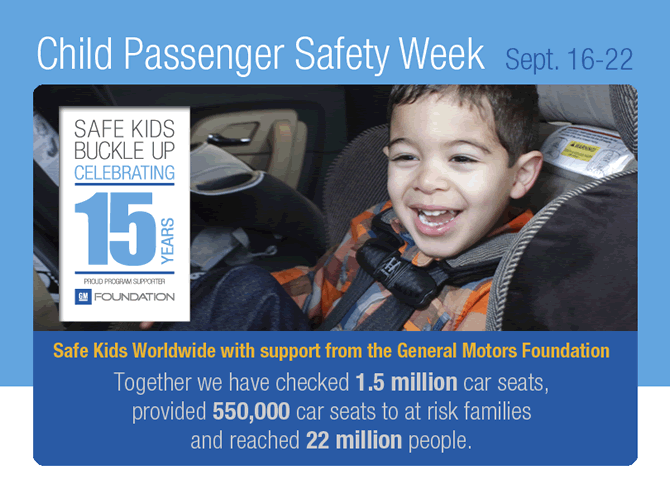 Parents are also encouraged to bring their car, car seat and child to a child safety seat inspection station near them. For further information go to www.safekidsnewjersey.com.